If you’re planning a trip to Argentina’s wine country, sooner or later you will probably hear of a place known as Valle de Uco. 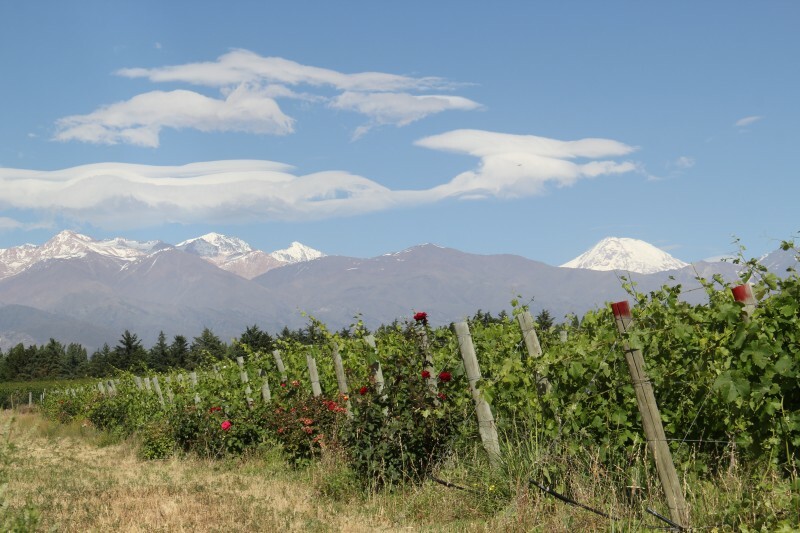 Over the last 20 years, Valle de Uco in Mendoza province has steadily been growing within the wine industry and now produces some of the best Malbecs in the world. 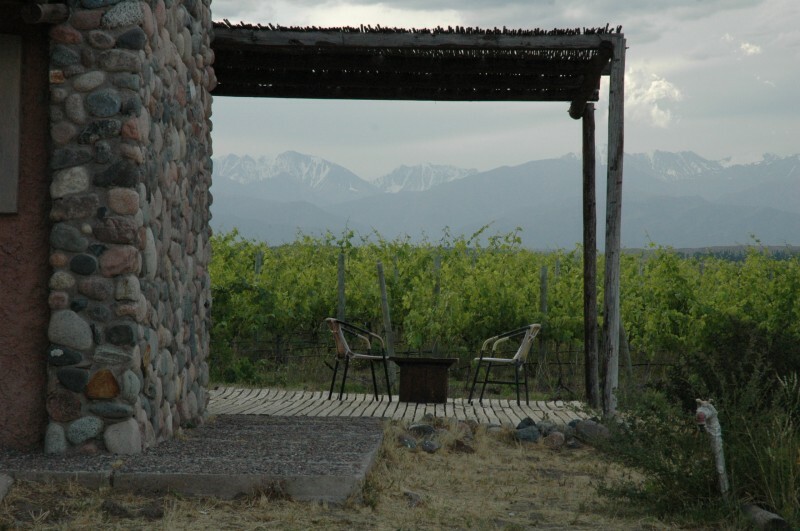 Located just over an hour south of the city of Mendoza the region is known to produce premium wines and is easy to reach. 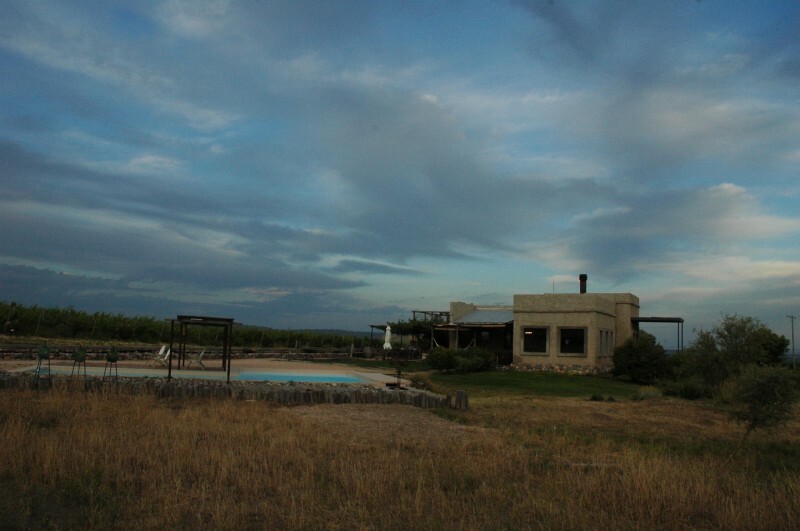 You will find unbelievably stunning landscapes, the most prominent vineyards in Argentina such as Salentein, Lurton and Azul, and a handful of relaxing and luxury accommodations. We decided to stay at one of the premier wine hotels in the valley, Tupungato Divino, for two nights. From the views of the Andes and vineyards from our room to the delectable food, we had an amazing stay. 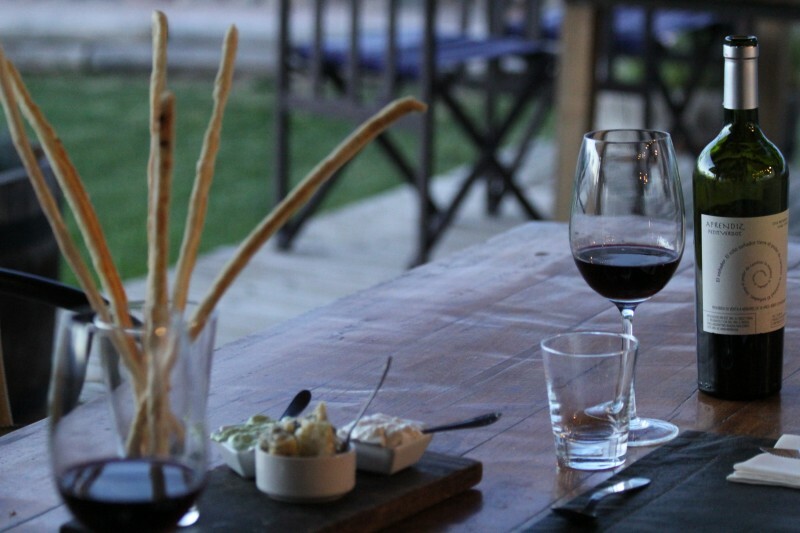 Tupungato Divino is an intimate hotel that coins itself a wine hotel—more-or-less a mix of a boutique hotel resort in wine country with a tremendous selection of wine to both taste and buy. It is located along route 89 around 10km outside of the small town of Tupungato. It’s best to reach by car, but if not you can easily hail a cab from Tupungato or Mendoza and arrive at the hotel. The hotel consists of a restaurant and wine shop as well as two smaller cabana buildings with a total of four rooms. This provides a perfect sense of privacy and allows you to enjoy both your room and private patio all to yourself at sunset. 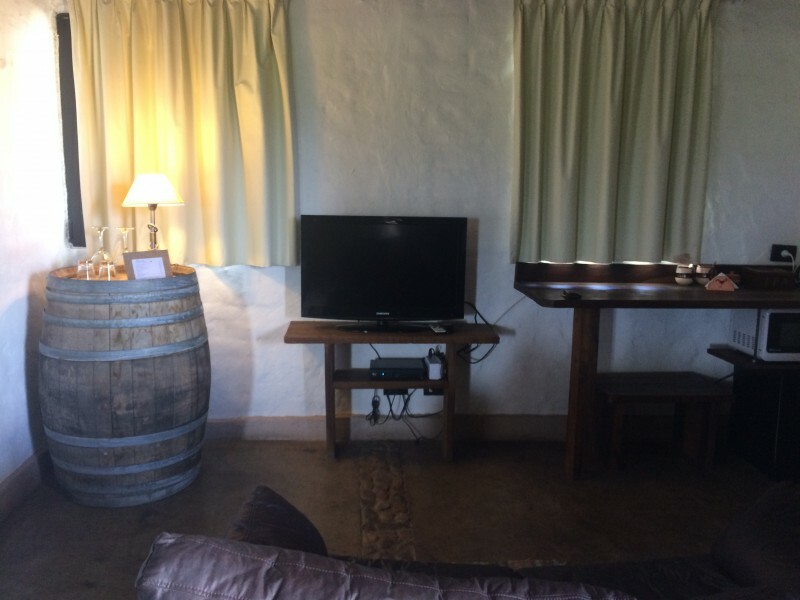 The rooms are well decorated and fit seamlessly into a rustic wine country setting. We had a king size bed and a smaller alcove with a couch, TV area, and minibar. There is also a wood-burning fireplace for cold nights. 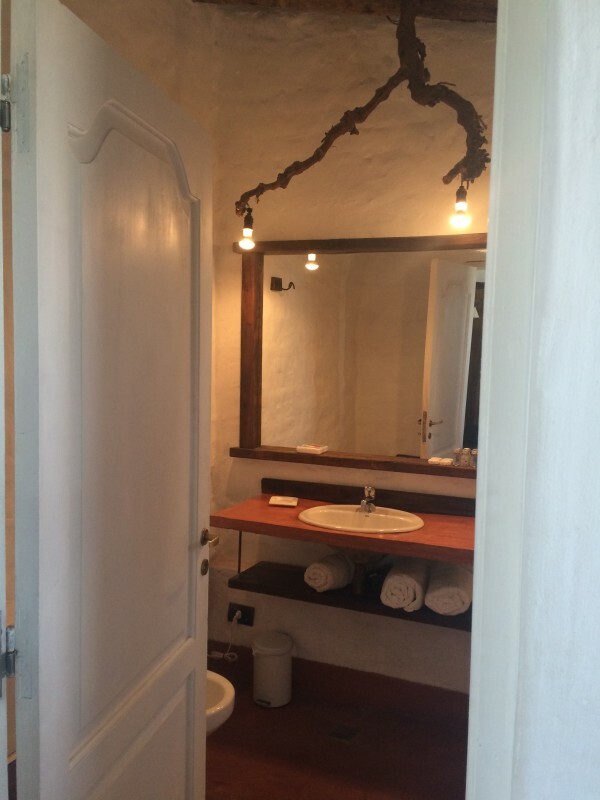 The room has a rustic style with adobe white-washed walls, which gives the place a very relaxed feel. One thing I really enjoyed about the design elements of the room was the use of raw wood in the light fixtures. The views of the Andes and vineyard from the room are priceless and make for the perfect setting both to enjoy at sunset and to wake-up to in the morning. 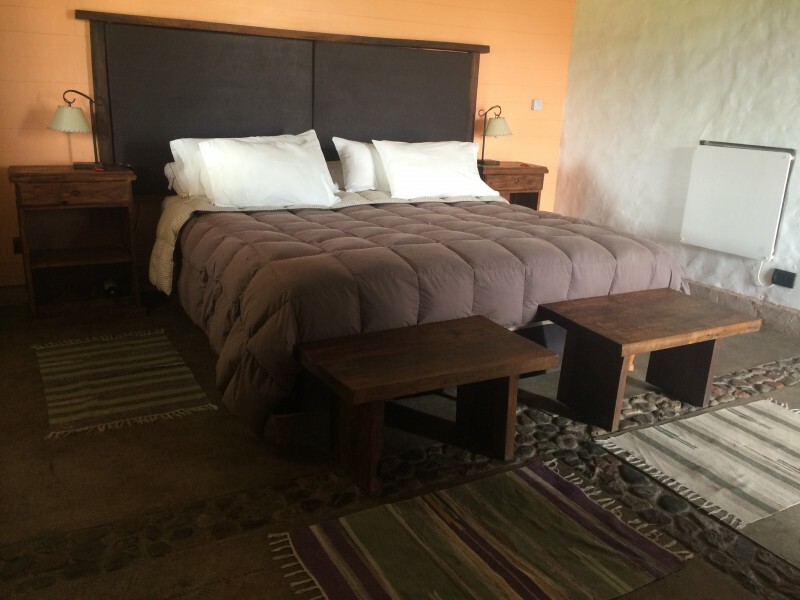 Each room has a private patio with chairs and a small table for star gazing, or sipping a bottle of malbec at sunset. There is also private parking if you have your own car at the hotel. The restaurant at Tupungato Divino is superb, and I must say some of the best food we’ve had while on our three month trip through Argentina. 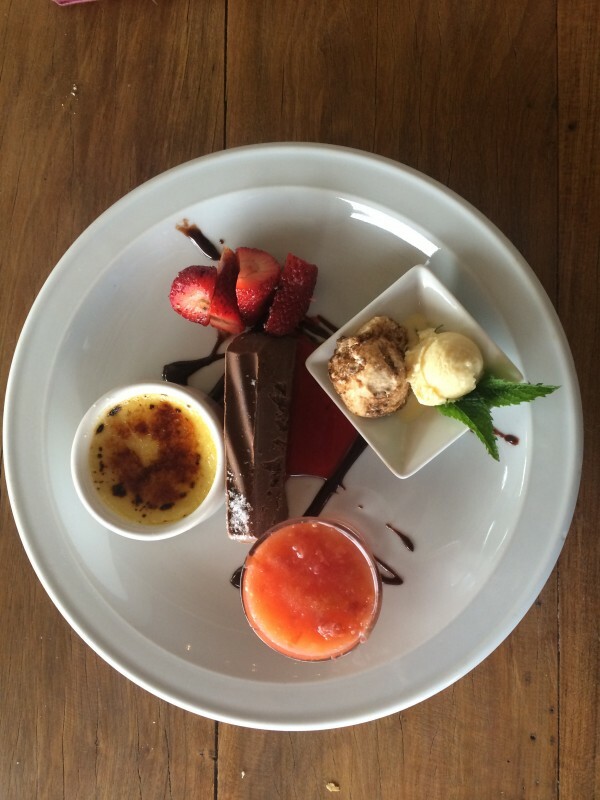 It is a very relaxed setting and also reasonably priced. 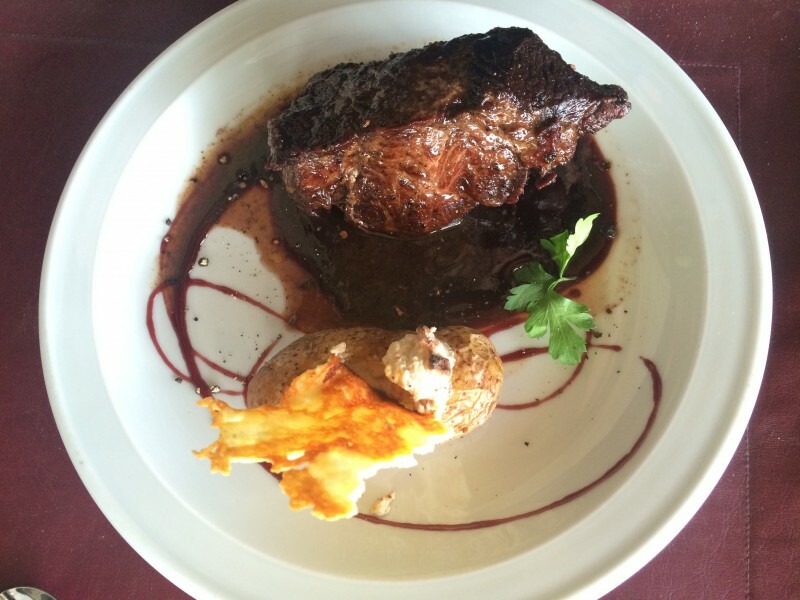 For lunch they offer a four course meal for $220 pesos, this is by far one of the best quality and value lunches in the valley. At night time the restaurant is private and only open to guests staying at the hotel. 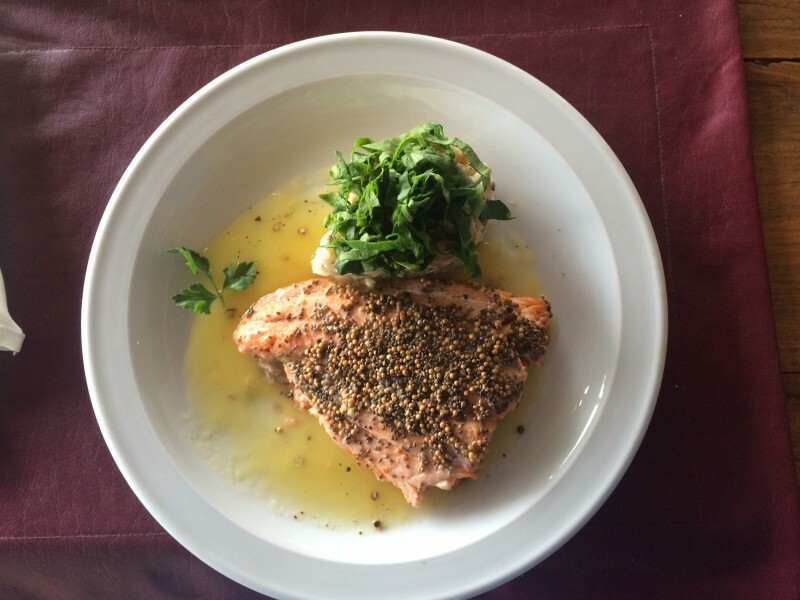 We enjoyed the creative and delicious choices on the menu from bife de lomo with Malbec reduction, chia seed encrusted Salmon, and an assortment of amazing appetizers and desserts. I think we tried just about everything on the menu! Breakfast at the hotel is also quite wonderful and is perfect to be enjoyed outside on the patio when the weather is right. 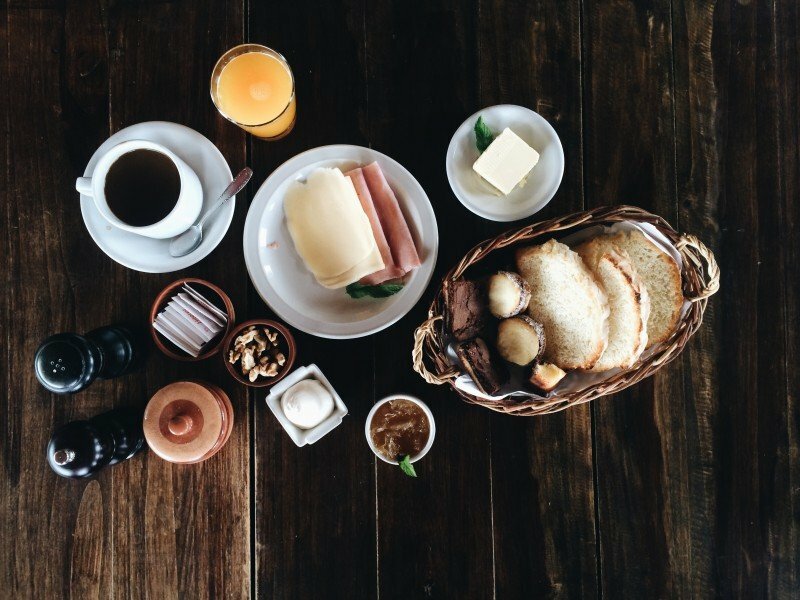 They serve fresh baked breads and pastries, homemade jams, fresh coffee, orange juice , meats and cheeses, and eggs made to order. I really enjoyed that the hotel is small and personable making it so you can almost eat whenever you want and you don’t have to worry about the crowds. One of best parts of the hotel is that it is ideally set between some the best bodegas in the region. You can even walk to a handful, including Domaine Bosquet and journey further to other bodegas to including, Azul, Atamique, Andaluna, Salentein, and more. 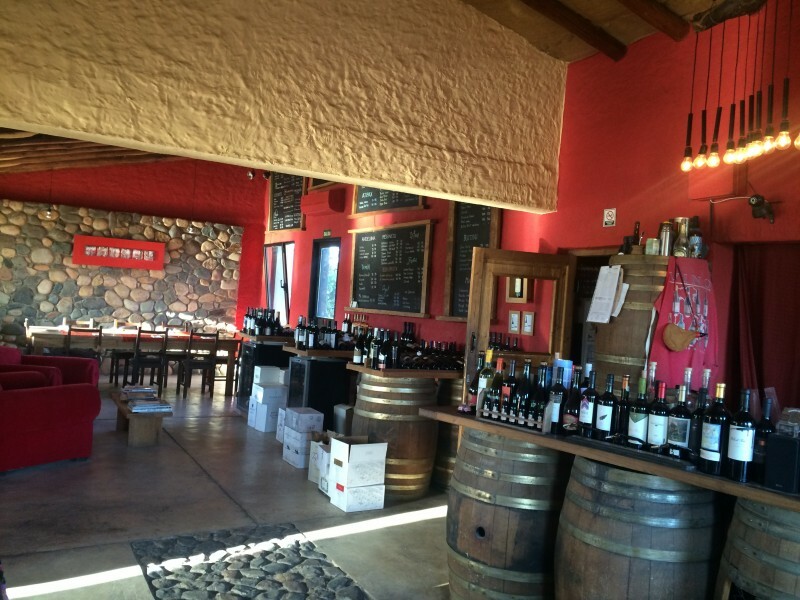 Another highlight of Hotel Tupungato Divino is their extensive wine shop. They feature over 170 premium wines from the area and the owners, Pablo or Sergio, are more than happy (and very qualified) to help you decide on which bottle to grab. They offer two prices, one for take-away and another for enjoying at the restaurant, but both were super reasonable and are a great way to acquire some harder-to-find wines. You’ll also find a lovely pool that you can soak up the sun and the views. It’s quaint and very private, but sadly we didn’t have any time to enjoy it during our stay. Overall our stay at Tupungato Divino was great. We enjoyed our room with stunning views and the private setting. On top of that, the food and service was exceptional and very personal. It’s certainly among the top boutique hotels to stay at if you looking for a small and high quality accommodation in Valle de Uco. Around 10 km outside of Tupungato, Argentina. Best if you have your own car, but can be reached by taxi. Close to many top bodegas. starting at $160 per night. is only availalable in the restaraunt, so don’t expect it in your room. Breakfast was good with multiple options, especially the fresh baked bread. was large with a great view, airy and comfortable. Also has a seating area with a flat screen TV with DirectTV. 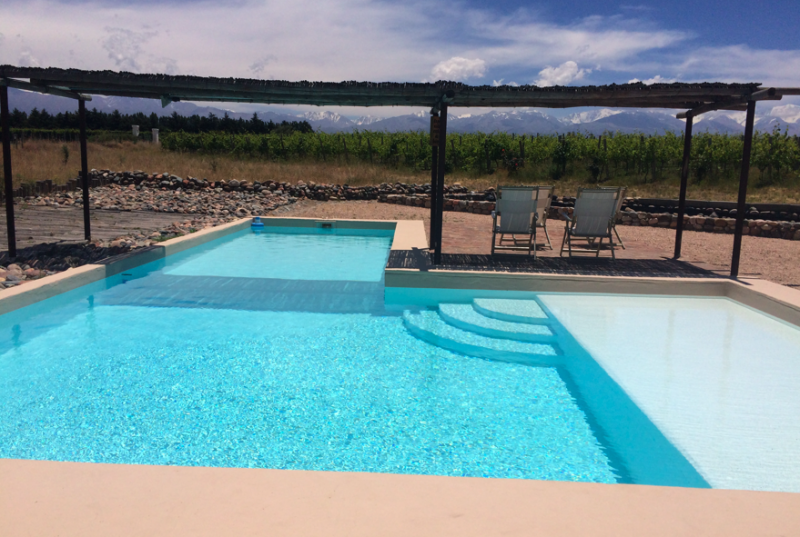 Overall I had a great stay at Tupungato Divino and would definitely return if I am ever in Mendoza if not to spend the night, but to have a great lunch with quality wine. Disclaimer: I was a guest of Tupungato Divino during this stay, but my review and opinions are solely mine without any outside influences.